South Korea’s colourful capital Seoul is one of the world’s largest cities, and this dynamic metropolis offers plenty of holiday highlights including a fantastic night life with bars, karaoke lounges and clubs galore, a series of architectural marvels, marvellous art, a great shopping scene with a mixture of bustling markets and mega shopping malls and amazing culinary offerings, with signature Korean dishes sold at street vendors, trendy cafes and Michelin-star restaurants. Seoul is famed for being technologically advanced, thriving with innovation and cutting edge appeal. Visiting here will certainly feel like you’re stepping into the future as there are super-modern buildings and hotels, speedy Wi-Fi everywhere, the latest designer goods, the Digital Media City and much more. Brightsun Travel offers direct flights to Seoul, taking you to the very heart of this high tech paradise. 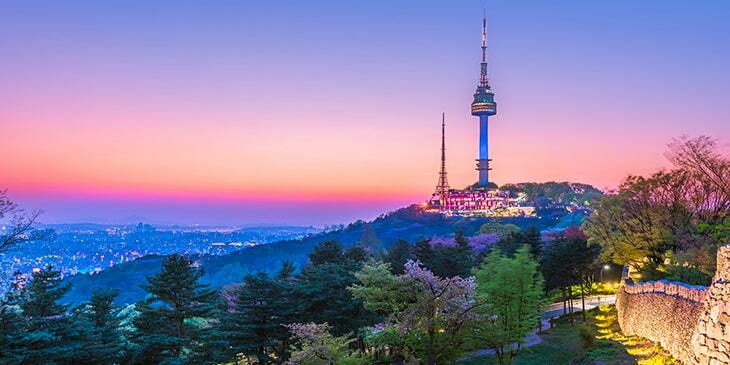 Despite its futuristic appeal, Seoul is a very historic city with many traces of its captivating past to discover, including well-preserved ancient temples, local villages with traditional historic houses and the city’s famed Five Grand Palaces. The Gyeongbokgung Palace is a highlight where you can witness the impressive changing of the guard ceremony, as well as the UNESCO World Heritage-listed Changdeokgung Palace, which was a former main residence of kings from the Joseon Dynasty. To learn more about Seoul’s history, you could visit the War Memorial of Korea, dedicated to those who lost their lives in the Korean War, the National Museum of Korea which displays an impressive collection of historic artefacts and Bukchon Hanok Village, which is filled with traditional Korean homes, old-style teahouses and colourful art galleries. There are plenty of lush green spaces and natural wonders in and around Seoul, which allow you to escape from the city bustle and relax for the day amongst picturesque surroundings. Seoul Forest and Hangang Park are popular scenic spots, both thriving in the spring with lots of cherry blossom trees in full bloom. The breath-taking Bukhansan National Park is around an hour away from Seoul via public transport, which offers thrilling hiking trails such as the Bukhansanseong path that ends at the summit of Mount Baegundae, the city’s tallest mountain peak. Just a short ferry journey away from Seoul is the beautiful Muuido Island, which boasts lush forested hills and stunning beaches. Book cheap tickets to Seoul with Brightsun and look forward to various adventures in this immense city.